A child prodigy as a violin virtuoso, Ferdinand David became concertmaster of Felix Mendelssohn’s Leipzig Gewandhaus Orchestra and was renowned throughout Europe as a soloist and educator. 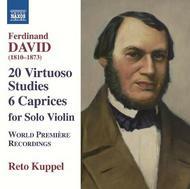 David’s 20 Virtuoso Studies, based on those for piano by his friend and colleague Ignaz Moscheles, are brilliant and completely idiomatic transcriptions for the violin. Melodies of great emotional depth and refined sensuality characterize the Caprices Op.9, often demanding lightning speed from the soloist.